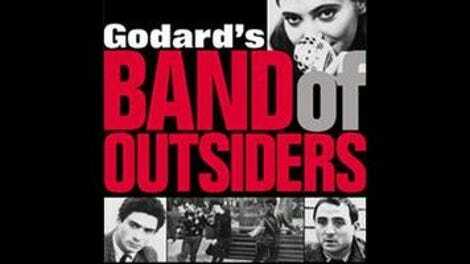 Thinly plotted, indifferently paced, often distracted, filmed against white walls or through drizzle on drab sidewalks, Jean-Luc Godard’s 1964 film Band Of Outsiders is a movie held together by attitude; its title has long since become a byword for all things timelessly and effortlessly hip and offbeat. Perhaps its importance in the iconography of movie cool has come to overshadow how sad it is, its free-spirited strokes—the famous sprint through the Louvre, the much imitated café dance sequence—made meaningful by its air of dejection. A flop in its original run, Band Of Outsiders—which is being released in a new restoration—has come to be regarded as one of Godard’s most accessible films. But behind its substantial charm and light touch is a movie that’s more morbid, alienated, and personal than it lets on. 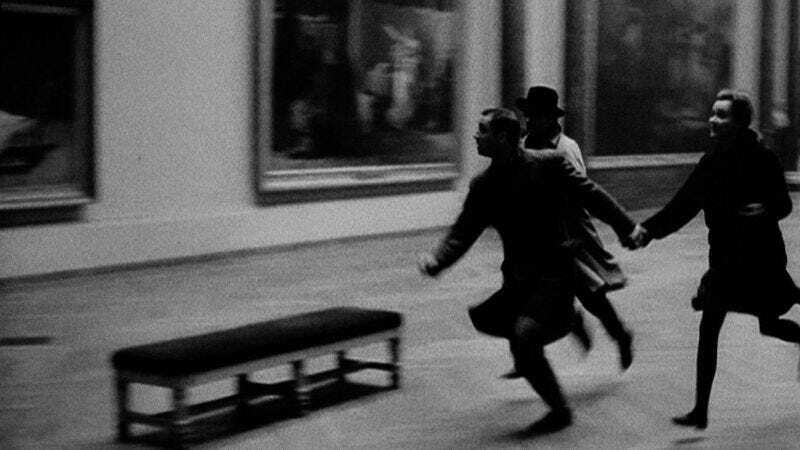 It’s a story Godard would tell over and over throughout the 1960s, with different subtexts: young men who think only in quotations; young women with conflicted feelings; tragic consequences. Aspiring criminals Arthur (Claude Brasseur) and Franz (Sami Frey) find a doe-eyed accomplice in Odile (Anna Karina, then the director’s wife and muse), whose aunt has supposedly stashed a fortune in her house. The viewer almost expects them to never go through with the robbery; nursing competing crushes on Odile, the men seem to be more comfortable in their imaginations than in the real world. They drive recklessly and aimlessly in a Simca convertible with the top pulled down, noir wannabes in an environment of uninspiring late-winter gray. Thanks to cinematographer Raoul Coutard’s superb black-and-white camerawork, Paris looks cold and empty, as though it were a resort town closed for the season. Band Of Outsiders contains some of the medium’s most sublime images of the anything-goes possibility of youth, but it also captures the hopelessness and loneliness of being young with nothing to do. Whether they’re planning a crime or performing an impromptu dance routine, the trio is mostly motivated by boredom, and everything carries a tinge of personal darkness; after all, these are men named after writers who died young (Franz Kafka, Arthur Rimbaud), trying to seduce a young woman played by the director’s wife—who attempted suicide during pre-production, and came to the set straight from the hospital—and named after his mother, who had died in an accident a decade earlier. Artistic failure, death, and ruined relationships are heavy themes to smuggle into a deconstructed caper comedy that was supposed to be Godard’s most commercial project since his groundbreaking debut, Breathless. With Godard as its omniscient voice-over narrator, Band Of Outsiders creates an unusual intimacy between director and audience; he often sounds as though he were leaning in on the viewer from behind in a screening room. In other words, it seems deeply personal, even if the audience doesn’t know why. And yet it leaves an overwhelming impression of pure creative brio. Countless films have tried to copy its mix of deep-seated melancholy and unpredictable wit, though none have equaled it, in part because it requires tremendous talent and a near-pathological disregard for expectations and conventions. It’s fun and disruptive in ways that are totally unique to filmmaking; the sense of play seeps into everything from the credits (including one of film history’s best title cards) and the sound design to the jolting changes in tone. For a movie that’s so moody and morose, it sure feels fresh.